The automotive 48 volt battery system market is expected to surpass US$ 1.77 Bn by 2026, expanding at a CAGR of more than 65% during the forecast period. The 48 volt battery system comprises a 48-volt Lithium ion battery, AC/DC inverter, battery controller, and power distribution box. The 48 volt battery system delivers four-times the power of a 12 volt battery. The 48 volt battery system has been widely adopted in mild hybrid vehicles and is likely to be adopted by most performance and luxury vehicles during the forecast period in order to boost the performance and efficiency of vehicles. Emission standards are becoming increasingly stringent due to challenges posed by high polluting constituents such as carbon dioxide, nitrogen oxides, carbon monoxide, and sulphur dioxide. 48-volt drive vehicle drastically reduces emissions and hence, is poised to be an alternative technology. 48 volt battery systems are cost-effective hybrid solutions as compared to conventional battery electric vehicles to reduce emission. Rise in trend of vehicle electrification has necessitated the use of more powerful 48 volt battery, thus driving the 48 volt battery system market. The 48 volt battery system enables the battery to be recharged by regenerative braking, thereby improving the battery efficiency, which in turn is a key factor driving the market. Increased demand for mild hybrid vehicles in developing countries, owing to their efficiency and cost-effectiveness, is likely to boost the market for 48 volt mild hybrid vehicles. Demand of 48 volt hybrid system is estimated to decline after 2025, owing to high emphasis on the production of zero emission vehicles by governments across the globe. Moreover, integration of 48 volt battery system increases the cost of 48 volt system integrated battery electric vehicle, which is a key factor restraining the 48 volt battery system market. However, lower running cost and efficiency of the 48 volt battery system integrated vehicle are expected to boost the 48 volt battery system market. In terms of electric vehicle type, the global automotive 48 volt battery system market has been segmented into battery electric vehicle, mild hybrid electric vehicle, plug-in hybrid vehicle, and hybrid electric vehicle. The mild hybrid electric vehicle segment holds a key share of the global automotive 48 volt battery system market, as key players have developed their 48 volt battery systems for mild hybrid electric vehicles only; however for the other electric vehicle type segments, the technology is still in the development phase. Valeo SA, leading global player showcased its 48 volt all electric vehicle at the CES 2018. This indicates that the market for 48 volt battery system for zero emission vehicles is likely to expand in the near future, as the production for hybrid and internal combustion engines is likely to decline after 2025 as per the announcement of major automakers such as Volkswagen. Based on vehicle type, the global automotive 48 volt battery system market has been classified into passenger vehicle, light commercial vehicle, and heavy commercial vehicle. The passenger vehicle segment held a major share of the global automotive 48 volt battery system market owing to the high integration of the 48 volt battery system in passenger cars such as Renault Scenic and Buick LaCrosse. Furthermore, according to the announcements by automakers, passenger cars are expected to hold a major share of the market during the forecast period. Audi and BMW are expected to integrate the 48 volt battery systems in some of their models by 2022, thus boosting the passenger vehicle segment. Major manufacturers of light commercial vehicles such as RAM and GMC have announced to integrate the system in their vehicles, which in turn is expected to boost the light commercial vehicle segment of the market in the near future. In terms of region, the automotive 48 volt battery system market has been segmented into North America, Europe, Asia Pacific, Latin America, and Middle East & Africa. 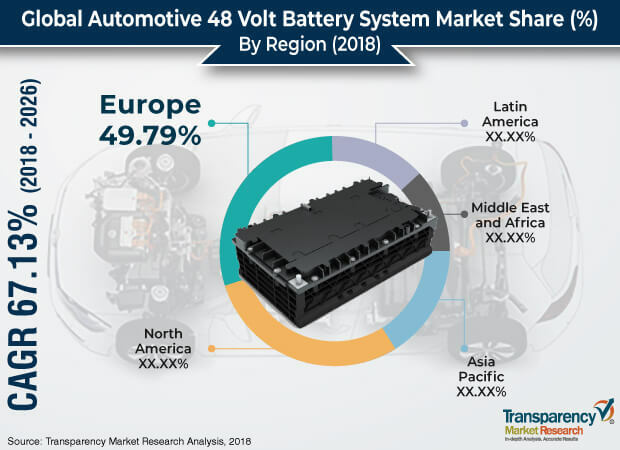 Europe is expected to hold a major share of the global automotive 48 volt battery system market owing to the production of the most luxury and performance driven vehicles in the region. Moreover, all manufacturers of 48 volt battery systems have their presence in Europe, which is estimated to boost the 48 volt battery system market in the region during the forecast period. Asia Pacific is expected to be a highly lucrative market for the 48 volt battery system due to presence of developing countries in the region, since battery electric vehicles are highly expensive and 48 volt mild hybrid vehicles are a better alternative to electric vehicles. Key players operating in the global automotive 48 volt battery system market are A123 Systems LLC, Continental AG, Dephi technologies, East Penn Manufacturing Company, EnerSys, Furkawa Electric Co, Ltd., GS Yuasa Corporation, Hitachi, Ltd., Johnson Controls International Plc, BorgWarner Inc., Robert Bosch GmbH, Valeo SA, Vicor Corporation, and ZF Friedrichshafen AG. Delphi and Valeo SA are prominent players operating in the global automotive 48 volt battery market and have presented various prototypes with 48 volt battery systems at auto shows. The report contains value chain analysis, which provides a comprehensive view of the global automotive 48 volt battery system market. The Porter’s Five Forces analysis for the market has also been included to help understand the competitive landscape in the market. The study encompasses market attractiveness analysis, wherein end-users are benchmarked based on their market size, growth rate, and general attractiveness. The study provides a decisive view of the market by segmenting the market in terms of component, electric vehicle, vehicle type, and region. These segments have been analyzed, based on present and future trends. Regional segmentation comprises current scenario along with forecast of the automotive 48 volt battery system market. The forecast provided is based on the compilation of current trends as well as expected scenario in the future, due to change in technological, geographical, political, and economic factors such as rising preference toward hybrid and electric vehicles. The study includes profiles of major companies operating in the automotive 48 volt battery system market. The global market is dominated by major automotive 48 volt battery system manufacturers such as A123 Systems LLC, Continental AG, Dephi technologies, East Penn Manufacturing Company, EnerSys, Furkawa Electric Co, Ltd., GS Yuasa Corporation, Hitachi, Ltd., Johnson Controls International Plc, BorgWarner Inc., Robert Bosch GmbH, Valeo SA, Vicor Corporation, and ZF Friedrichshafen AG. Market players have been profiled in terms of attributes such as company overview, financial overview, business strategies, and recent developments. The automotive 48 volt battery system market is primarily driven by emission norms, prompting automakers to adopt the system. The report provides the estimated market size of automotive 48 volt battery system in 2017 and forecast for the next nine years. The global market size has been provided in terms of value (US$ Mn) and volume (units). Market figures have been estimated, based on component, electric vehicle, vehicle type, and regional segments of the automotive 48 volt battery system. Market size and forecast for each major segment have been provided in terms of global and regional/country markets.